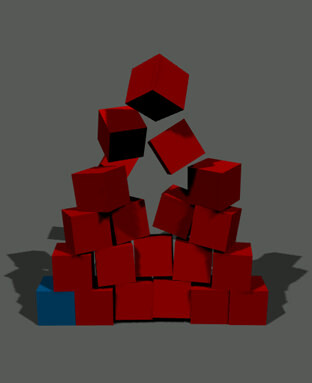 Rigid body (also requires a shape to be assigned) - enables simulation of objects in accordance with rigid body dynamics. 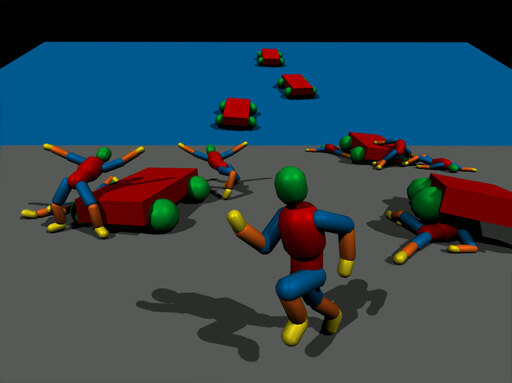 Ragdoll body (also requires a shape to be assigned for each bone) - provides bone-animated characters with procedural animation of a death sequence. 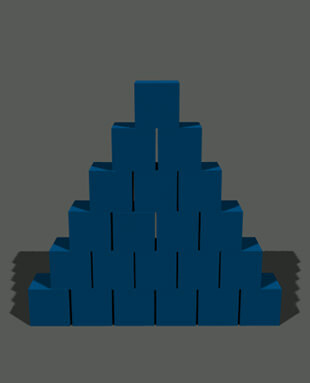 Fracture body - enables real-time simulation of destructible objects. Rope body - enables physical simulation of varios types of ropes and wires. Cloth body - enables physical simulation of various cloth types of cloth. Water body - enables physical simulation of liquids of different density and viscous behavior including buoyancy effect and wave dynamics. Dummy body - a static type of body without physical properties. It is used to attach other bodies via joints. Path body - a static type of body without physical properties. It is a spline, along which an arbitrary rigid body can be moved. After being enabled, all of these bodies and their shapes that approximate object's volume share common properties of rigid objects obeying Newtonian mechanics. Linear motion. If we imagine that the orientation of the body is fixed, then the only movement the body can undergo is translation motion — change in linear position. This change is performed with a linear velocity. Setting a body's linear or angular velocity will immediately make it move or rotate in a specified direction. p = m * v.
By causing the body to undergo an acceleration (i.e. to change its velocity over time), force controls its velocity and position indirectly. Forces acting on a body do not affect it immediately, they are accumulated before each physics simulation frame, and during simulation the resulting force, if unbalanced, is applied. Then forces are reset to zero to be calculated anew for the next frame. The same is true for torques. Impulse is the integral of force over time. It may be be regarded as the change in momentum of an object to which a resultant force is applied. For example, when two bodies collide, they exchange impulses that are equal and opposite, as Newton's third law applies, and in the result objects move apart. Similarly to the linear momentum, the angular momentum is the measure of the "quantity of rotation motion" and can be thought of as an extent, to which the body will continue to rotate around an axis of symmetry. It is expressed as the product of the inertia tensor of the body and its angular velocity. Rotation continues until torque, a rotational force, is exerted on this body. Torque is the cross product of the radius vector (a vector from the center of mass to the point where torque is applied) and the force vector (the magnitude of the force). Loosely speaking, it acts like a lever affecting rotational speed. Forces and impulses can also be applied to an arbitrary point of the body and may cause body rotation, when this point is not the center of mass. In this case, force is computed as cross product of force vector and radius vector (from a center of mass to the necessary point) and is added to the torque. And the other way around, torque applied not to the center of mass increases force. Unlike forces and torques, impulses immediately change body velocity as the physics is updated. The center of mass is automatically calculated as the mean location of mass of all the shapes that approximate the object. It serves as a reference point for linear motion and rotation, as well as application of external force and torque. Density value evidently depends on the mass value and vice versa: the higher the values are, the heavier and more dense the object is. Density determines buoyancy of the body in accordance with Archimedes' principle. The higher the density, the less tendency a body has to float. When the object begins moving in a definite direction, the linear damping force slows it down up to a complete stop. Similar to linear damping, angular damping reduces angular velocity of objects over time, so that their rotation ceases. To the linear damping of the body the global Linear damp is added, and the exponential function is calculated. In exactly the same way, to angular damping of the body the global Angular damp is added. These two parameters ensure that objects smoothly come to a stop and no calculations are done for unnecessary motion. Maximum linear and angular velocity define the maximum possible velocities of the body. Velocities that exceed this limit will be clipped. For example, maximum linear velocity parameter can help to avoid tunneling (penetration) effect. There are also global maximum linear and angular velocities thresholds. The global maximum is compared with the maximum set for the body, and the minimum value is chosen to clip the actual velocity. The resulting calculated friction depends on the objects' masses and gravity, and the angle between contacting surfaces. E.g. if a body slides down an inclined plane, the friction is lower, because less is the force of gravity that is perpendicular to the face of the surface. Friction is calculated on contact between physical bodies. If the surface is assigned a surface_base property, which has a corresponding parameter, it also contributes to calculations. Coefficient of restitution determines the degree of relative kinetic energy retained after a collision. It defines how bouncy the object is by contacting with another object. It depends on the elasticity of the materials of colliding bodies. The simulated restitution, like friction, considers the total value for both objects being in contact. The maximum value of 1 models elastic collision. Objects bounce off according to the impulse they get by contact. The minimum value of 0 models inelastic collision. Objects do not bounce at all. Again, just like friction, restitution is calculated by the contact between physical bodies. When a body does not move and stays in the equilibrium for some time, it will most probably be immobile until an external force is exerted on it and urges it to move again. During this period of inactivity, there is actually no need to simulate it. This state is called freezing and it allows to save a great deal of computational resources. Its linear velocity is lower than Frozen linear velocity and its angular velocity is lower than Frozen angular velocity. At the same time both velocity values must be lower, otherwise, the simulation will not stop. There are also Frozen linear velocity and Frozen angular velocity thresholds set for the whole world. These global freezing thresholds are compared to the ones set for each body, and the highest value is chosen to freeze the body. Velocity values should stay lower than frozen velocities for the number of Frozen frames. This is done to ensure that the body has really terminated its motion. When the body is frozen, its linear and angular velocity are set to 0. 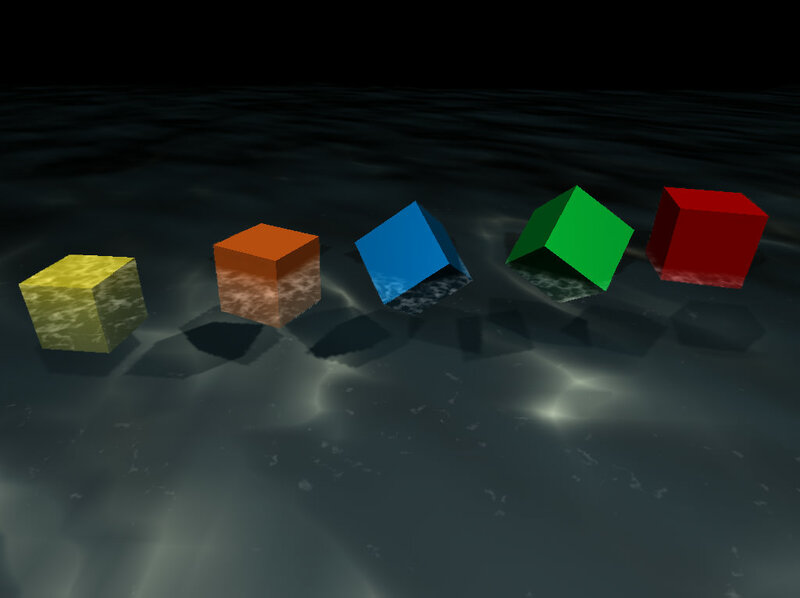 The simulation of the body starts again as another non-frozen object touches it or some force is applied to it.